MET-ALL™ products are made from high-strength, light weight H.D. 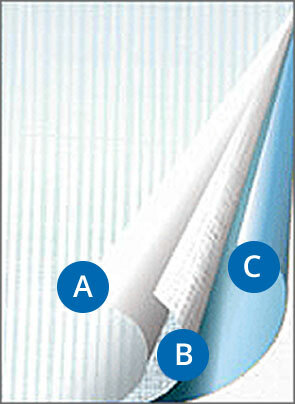 Woven Polyethylene fabrics which are then extrusion coated with L.D. Polyethylene film. This film is formulated with Cortec® VCI-126 corrosion protection. MET-ALL™ products offer high strength, tear resistance, durability and maximum corrosion protection for all ferrous and non-ferrous metal products. Metal products are wrapped in MET-ALL™. The package is completely covered but not air tight. The package is then allowed to remain at room temperature for a minimum of 24 hours. During this time VCI phase action migrates and vapourizes wherever humidity and corrosive agents can penetrate, to provide corrosion protection to both external and internal surfaces. This protective layer prevents moisture, salt, dirt, oxygen and other materials from depositing on the metal and causing corrosion. MET-ALL™ continues to protect the packaged product for up to 12 months. When the package is unwrapped, the VCI vapour dissipates without the need for washing or degreasing.